April 28th is the National Day of Mourning. We pay our respect to the men and women who have been injured or killed in work related incidents. Please note that ACRC offices in Cape Breton, Nova Scotia, and Prince Edward Island will be closed on Monday, February 19. Offices in New Brunswick and Newfoundland and Labrador will be open regular office hours on Monday. Where as we have several members who pay dues online and via credit cards, the ACRC will no longer be generating and mailing receipts for these payments. Your financial institution can provide a record to you that indicates proof of payment. Going forward, receipts will only be provided to those members paying cash at the counter. PLEASE NOTE: YEARLY DUES PAID STATEMENT LETTERS ARE NOT AFFECTED AND WILL BE SENT OUT VIA CANADA POST TO MEMBERS BY THE CRA REQUIREMENT OF FEBRUARY 28TH. The latest issue of The Blueprint is now available! You can browse current and past issues on our website here. Members automatically receive a copy by mail or they can be picked up at your local union office. The Journeymen Leadership program is held at the UBC International Training Center in Las Vegas, NV. Please note that members can only attend the Journeymen Leadership program once. For more information on the Journeymen Leadership program, please click here to view our Programs page. Just a reminder that the application period for the Robert J. Watson Bursary program will be closing on Wednesday, November 22 2017. 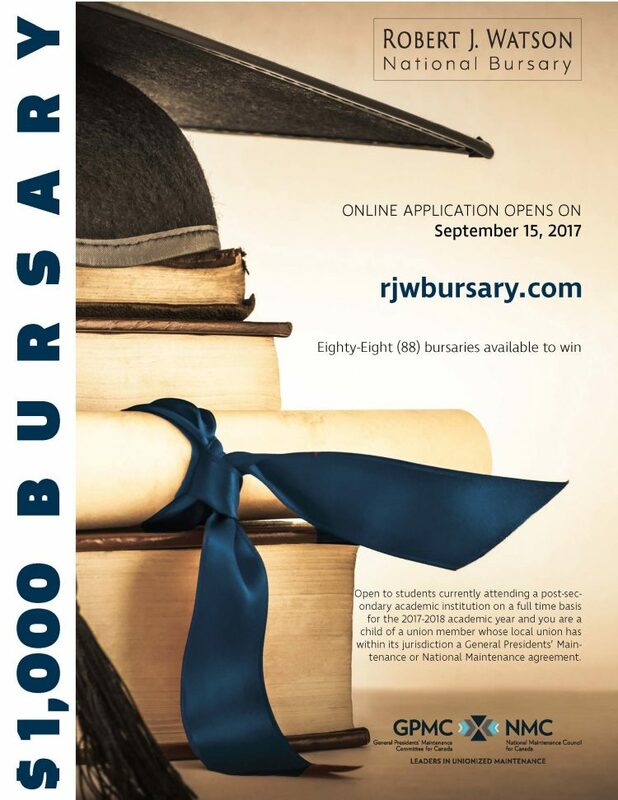 Please be sure to get your applications in before this date at www.rjwbursary.com. At this time, the province of Nova Scotia has not received enough applications to match the number of bursaries awarded – there is free money up for grabs! If you prefer to submit a paper form by email, click here to download the form. The form should be emailed as an attachment to mmalles@gpmccanada.com to ensure it is received by Wednesday, November 22, 2017. The Atlantic Canada Regional Council of Carpenters, Millwrights and Allied Workers (ACRC) has one (1) opening for a Receptionist position in its Sydney, NS office. The successful candidate is an experienced receptionist in a fast-paced environment. The ACRC represents unionized carpenters, millwrights, and allied workers throughout Atlantic Canada and is a part of the United Brotherhood of Carpenters and Joiners of America (UBC) with more than 500,000 members across North America. Competitive health and dental plan, and pension. Interested applicants should forward a cover letter and resume stating qualifications and experience by email to jwilson@acrc.ca no later than Friday, October 13, 2017. Please indicate ‘Receptionist-CB’ in the subject line of your email. 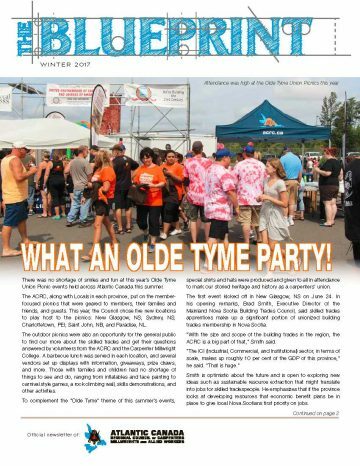 Our second Olde Tyme Union Picnic of the year is THIS SATURDAY, August 12! We are excited to partner with the Cape Breton Unionized Trades Dragon Boat Festival and will have a ton of activities for everyone, including a BBQ, bouncy castles, skills demonstrations, rock climbing wall, giveaways, and much more! Hope you can join us!